You lean in closer to the panoramic windows to better take in the settlements, farms and sawmills dotting a landscape defined by mountains, lakes and forests. Tranquility settles over you like a warm blanket as the train - and the beauty - takes you further and further away from your daily life. You cast a glance at your fellow travellers in the lounge and notice the beatific smiles on their faces. When you turn back to the window, your reflection tells you that you're smiling too. Explore a region rich in First Nations culture and history. 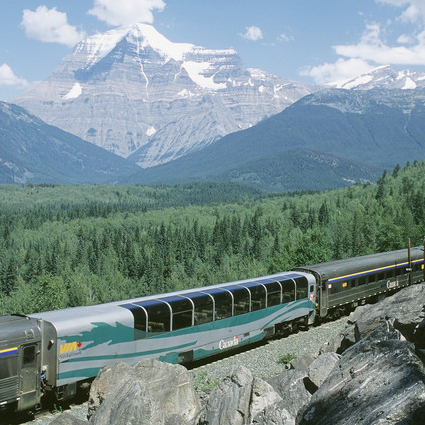 The Jasper-Prince Rupert train makes a two-day journey from the rugged splendor of Jasper National Park and the Canadian Rockies to the haunting beauty of the Pacific Coast. Choose the relaxing ambience and attentive service of budget travel in Economy class, or upgrade to Touring class to enjoy exclusive access to a dome car and all meals included in the price of your ticket. There's an overnight layover in Prince George - so don't forget to book a hotel room. You'll arrive in Prince Rupert feeling refreshed! For more information or to book this or any other journey, please do not hesitate to contact us.